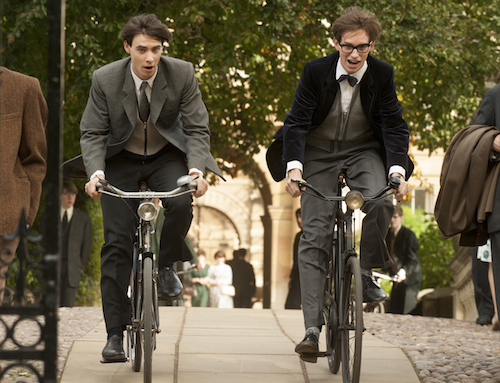 Synopsis: Starring Eddie Redmayne (Les Miserables) and Felicity Jones (The Amazing Spider-Man 2), The Theory of Everything is the extraordinary story of one of the world’s greatest living minds, the renowned astrophysicist Stephen Hawking, who falls deeply in love with fellow Cambridge student Jane Wilde. Once a healthy, active young man, Hawking received an earth-shattering diagnosis at 21 years of age. With Jane fighting tirelessly by his side, Stephen embarks on his most ambitious scientific work, studying the very thing he now has precious little of – time. Together, they defy impossible odds, breaking new ground in medicine and science, and achieving more than they could ever have dreamed. The film is based on the memoir Travelling to Infinity: My Life with Stephen, and is directed by Academy Award winner James Marsh (Man on Wire). The internet hype over the “ice bucket challenge” seems to have died down, but the fad has served its purpose; in addition to raising a bunch of money, it also raised awareness about amyotrophic lateral sclerosis, more commonly known as ALS or Lou Gehrig’s disease. The second most famous person afflicted with ALS is renowned physicist Stephen Hawking, and his story is documented in the biopic The Theory of Everything. As expected, The Theory of Everything is the story of the life and times of Stephen Hawking, played to utter perfection by Eddie Redmayne (My Week with Marilyn). The film begins with his college days, showing how he was head and shoulders above his peers in the department of raw intellect. The film shows his meeting of his future wife, Jane (Felicity Jones from The Invisible Woman), the earning of his doctorate, and his rise to the rank of one of the world’s leading analytical minds. Concurrently, the film also details Hawking’s affliction with ALS and the disease’s slow but steady progression through his body. While his mind continues to flourish and prosper, his body breaks down and fails him. Stephen and Jane try to balance his ambitious life goals with his debilitating condition. The screenplay for The Theory of Everything was adapted by Anthony McCarten (Death of a Superhero) from the book Travelling to Infinity: My Life with Stephen by Jane Hawking. This fact being known, the film becomes more interesting since, although the character of Jane is portrayed as a strong and loyal woman, she is flawed. The real Jane Hawking lets Stephen take center stage in the story, while her character crumbles under the weight of his troubles. The Jane in the film has her weaknesses and succumbs to them in spite of her love for Stephen. Director James Marsh (Man on Wire, Project Nim) treats Stephen with respect, showing him as graceful throughout his ordeal. Even the heart-wrenching scenes are injected with a bit of humor; in one scene, Stephen demonstrates to Jane that he can no longer play croquet, and in another, he gets stuck in a sweater while trying to put it on. The film doesn’t dwell on the depressing aspects of Hawking’s affliction, but chooses to emphasize his triumphs; when initially diagnosed, Stephen is given two years to live, but the film ends with him alive and kicking, still writing books and giving lectures more than fifty years later. It’s a fairly uplifting film about what is usually a very downbeat subject. And it’s a pretty cute little offbeat love story as well. 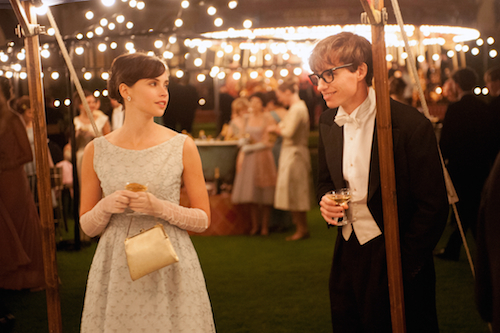 All this is not to say that The Theory of Everything is a feelgood movie. It does get dark at times, but there’s always a lightness to it, a bit of humor inserted into the serious situations to add a bit of levity. James Marsh successfully creates a mood that is somewhere between Good Will Hunting and A Clockwork Orange – simultaneously optimistic and dystopian. Making a biopic is always a dicey venture since the story is usually well known by the audience before they even set foot into a theater; they know the ending, it’s the journey that they want to experience. The trick is to tell the story in a way that is both informative and entertaining. With The Theory of Everything, Marsh does both. There is a distinct challenge to playing a character who is also a well-known, real-life personality. Everyone knows Stephen Hawking, so there’s not a lot of creative liberties that were available to Eddie Redmayne in regards to his portrayal of the man; any interpretation has to be deeply rooted in fact. 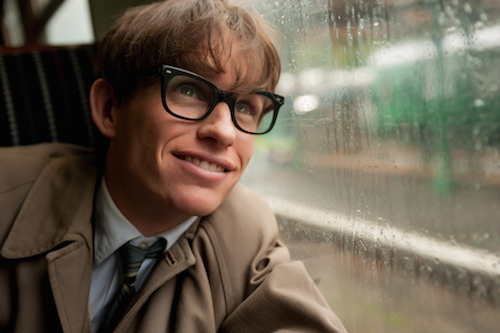 Redmayne chooses to play Hawking as close to the real man as possible. In short, Redmayne becomes Stephen Hawking. From the horn-rimmed glasses-wearing, college-aged protege to the motionless, wheelchair-bound robotic-voiced genius, Redmayne nails it. Felicity Jones is there for support as well, playing Jane with all of the strength and determination that the role requires, but she really is just there for support. 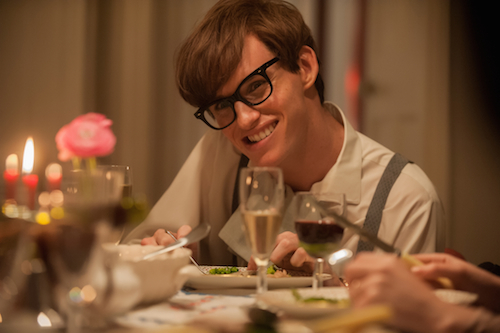 Eddie Redmayne steals every scene in The Theory of Everything, and sometimes he does it by doing next to nothing. Although the characters are at the root of The Theory of Everything, cinematographer Benoit Delhomme (Lawless) does a great job at putting his photographic stamp on the film without stepping on any toes. Delhomme uses plenty of layered shots, with action in the background and foreground, which help to illustrate the bustling world around Stephen and Jane. There are also plenty of sensitive close-ups and cutaways to objects like hands, medical equipment, pencils – anything that needs to be brought to the viewer’s attention. Delhomme also uses a lion’s share of creative camera angles, utilizing set pieces such as windows or trees as filters to add variety to his shots. In scenes that take place in hospitals, Delhomme pops on a fisheye lens to emphasize Hawking’s confusion and disorientation, giving the film a very abstract and distorted look during these segments. In some instances, it appears that Delhomme is showing off his skills, but it never comes at the expense of the picture as a whole. 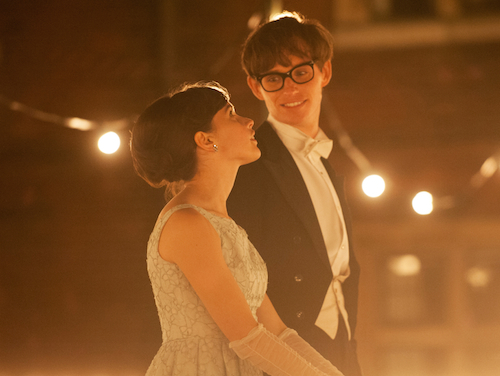 The Theory of Everything is shot very well, and the photography helps to tell the story effectively.